The current president of the Venice Biennale, Paolo Baratta asked Okwui Enwezor to orchestrate the 2015 edition with an exhibition between the Arsenal and the Giardini, entitled "All the World’s Futures." A total of 89 countries were represented through their national pavilions, without omitting the 44 collateral events scattered throughout the city. Addressing the future of the plurality of worlds comes down to considering their contemporary singularities by bringing them into confrontation, as does Okwui Enwezor at the Arsenal right at the entrance of his exhibition. 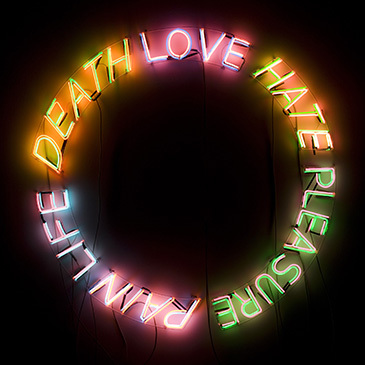 The coloured lights of life, death, love, hate, pleasure and pain of the American artist Bruce Nauman dialogue with the assemblies of African machetes by Adel Abdessemed. It is here at the entrance, that we also discover the more discreet work "Flickering Light" by Philippe Parreno that accompanies visitors in its variations throughout the entire exhibition. One might think, when one among them falters, of the obscurantism of those who would falsify history by destroying the works of a past that annoys them. Even those who denounce Umberto Eco and Davide Ferrario with a video installed in the Italian Pavilion that proposes to reinvent memory. For should we not, the better to face the future of all worlds, begin by considering the diversity of the past? 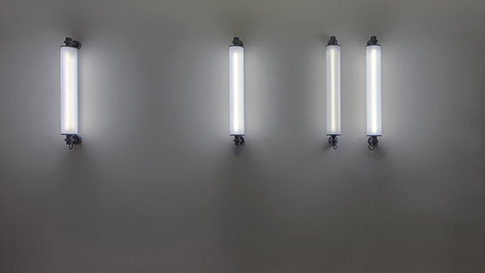 Philippe Parreno, Flickering Light”, 2013, Courtesy Esther Schipper Gallery, Source Alessandra Chemollo. In Venice, all the futures that are present coexist, as in the work "NoNoseKnows" by Mika Rottenberg, which is announced by large quantities of pearl beads. The Strange Universe of the New York artist, in his video, intertwines with the daily life of workers sorting beads with a dexterity that refutes the pace of the imposed cadence. Between the absurdity of the situations set up by Mika Rottenberg, where a woman’s nose singularly extends at the approach of a flower, and the tireless attention inherent in repetitive tasks, there are more formal transitions. They consist of short sequences with soap bubbles, which when they explode, release smoke. But what is this if not the announcement of the impending implosions of speculative bubbles giving birth to the unbalanced confrontations between the spheres of those who, without a care in the world, speculate with the realities of those who tirelessly produce? “The AK-47 vs. The M16”, 2015, Source Alessandra Chemollo. 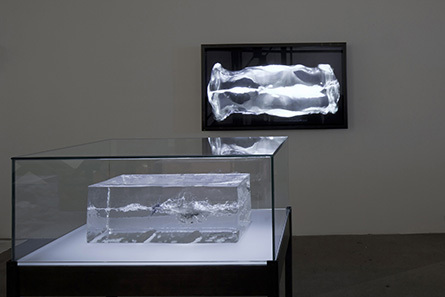 The confrontation awaits its climax in the opposition that figures in The Propeller Group, whose members are based between California and Vietnam, through a ballistic test entitled "The AK-47 vs. The M16 ". Both bullets cross one another in the centre of a block of resin perfectly illustrating the war that used to be described as "cold" and which evaporate in bursts of laughter amicably shared by Bill Clinton and Boris Yeltsin. But the respite was short-lived before these same weapons appeared in conflicts that benefit, we no longer know who, unless it is arms traffickers. The most serious is that the war of worlds has been replaced by the clash of civilisations, which deprived of their respective shares of madness, would have everything to share. This is what Okwui Enwezor is perhaps suggesting by introducing weapons ranging from Abdessemed’s machetes to the imposing artillery piece by Pino Pascali. Twenty-nine nations, including France, are represented by their historical pavilions. And it is Celeste Boursier-Mougenot who has this year invested the French pavilion, moving closer to neighbouring nations like Britain and Germany, because his installation, entitled "Revolutions" consisting of three trees whose gigantic clods of earth seem to float in space, unfolds around the French monument. 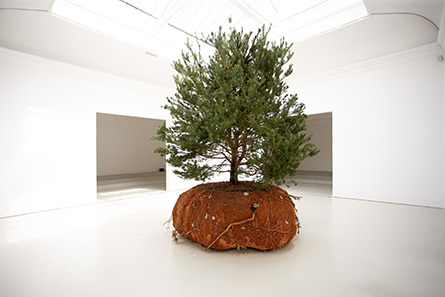 The trees, decorated by Celeste Boursier-Mougenot appear autonomous when surreptitiously, they start moving. Connected to each other and to those that shade the area, they embody this nature whose abundant energy Goethe knew so well, even though it is the emptiness of their movements that makes us wonder. Like idle robots, they wander around and we begin to imagine them at night, released from the gaze of spectators who loudly, rediscover nature in another fashion. The future is in question at the Korean pavilion, which was the last of the national pavilions to be built in the Giardini. Outside and inside, the artists Moon Kyungwon & Jeon Joonho have dressed it in video textures portraying a wandering world ("The Ways of Folding Space & Flying"). Its interior architecture has been reconstituted and enhanced with a multitude of interfaces and the androgynous being controlling these interfaces, unless it is the opposite, wanders about in the pavilion space. But very soon the representation of this future world appears to us as too slick. Its lack of asperities bothers us just as the extreme perfection of the universe of the AES+F group challenges us. The monstrosity of hybrid beings that populate "Inverso Mundus" in the Maggazine del Sale # 5, does not reassure us in the least about the possible future of an "upside down" world where boredom would be the perfect excuse for torturers, human or animal, to perpetrate torture for entertainment. & T293 Gallery, Source Nick Ash. Many of the spectators of the Biennial transit through the Marco Polo airport where countless entirely interconnected databases know our arrivals and departures with the greatest precision. This is where Simon Denny’s exhibition representing New Zealand begins this year. 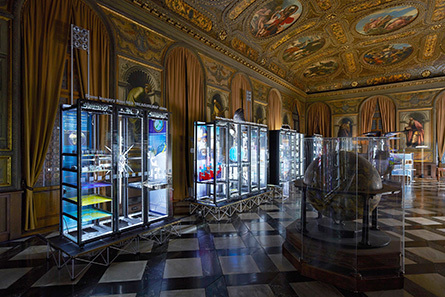 The artist announces "Secret Power" through paintings and decorations from the Biblioteca Nazionale Marciana, while in the same Renaissance library of the Piazzetta San Marco, it is racks of servers that fill the space. The staging of the artist confronts the imagery of NSA PowerPoint screens that Edward Snowden broadcast in 2013 with the visual universe of David Darchicourt, who we learn was a graphic designer for the NSA. But hasn’t the design of information always been an instrument of power in the service of state institutions and private companies, which today draw up the mapping of our activities to better anticipate our every desire? The exhibition "Together" on the island of San Giorgio Maggiore facing the Doge's Palace, is one of the most notable collateral events of this 56th Venice Biennale. 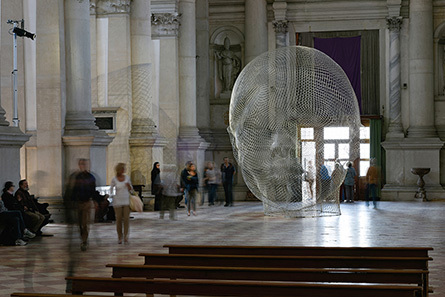 The artist Jaume Plensa has taken over the basilica and the abbey there. In the Basilica, there is a hand made from letters of eight different languages that welcomes us. But it also seems to be addressing the carved head of metal mesh that gives it real transparency. Everything in this place of worship and exchange is a matter of serenity, of being together. What Jaume Plensa is looking for beyond his quest for beauty is to "produce silence" in order he tells us, "to leave the visitor alone with themselves" and in this he succeeds remarkably. As for the curator Clare Lilley, she would like this exhibition to "connect people of many faiths and of no faith", those of "all worlds" so they can, together, project themselves into a common future. Written by Dominique Moulon for Digital MCD and translated by Geoffrey Finch, May 2015.